This is Shrek the sheep. Shrek is a Marino sheep which is a breed especially prized for its fine, soft wool. He became famous in the spring of 2004 when after avoiding being caught and shorn for six years he was found hiding out in caves. Of course, during this time his fleece grew without anyone there to sheer (shave) it. 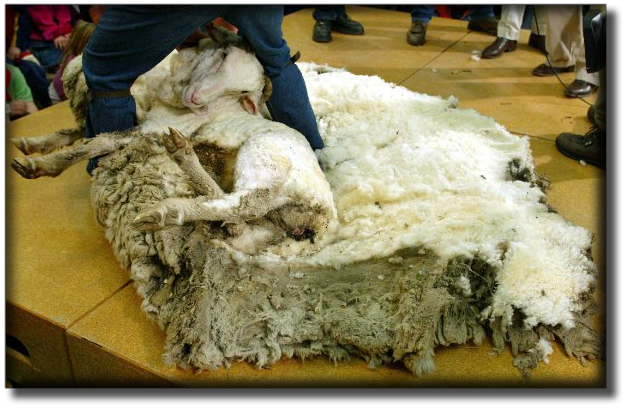 When Shrek was finally found and shaved, his fleece weighed an amazing sixty pounds! Most Marino sheep have a fleece weighing just under ten pounds, with the exception usually reaching thirty-three pounds. 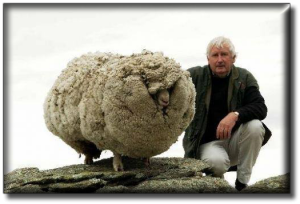 Beginning in 1998, this sheep began to take on the additional weight of it’s unshaven wool by avoiding the care of its shepherd. It took six years to reach the weight of 60lbs. with every year, increasing the burden this poor creature was carrying. 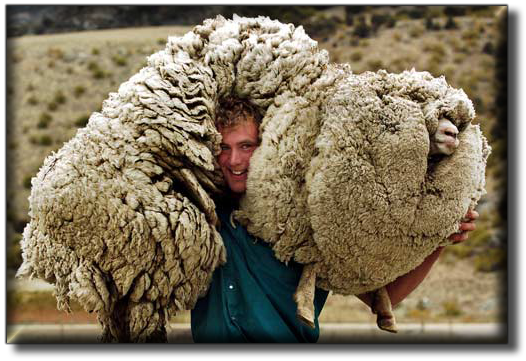 The change was gradual and so Shrek’s body acclimated to the additional load, but such weight takes its toll on a sheep which was not designed to carry burdens. Most sheep in Shrek’s situation would have perished. Sheep are creatures which are very dependent upon their shepherds for survival. They will graze land until they’ve destroyed the roots and will wander, sometimes into dangers way without realizing. They are spooked very easily, even by something as gentle as water flowing down a river. No one knows for sure why Shrek avoided his shepherd, nothing suggested mistreatment. Nevertheless, fear likely had something to do with Shrek’s behavior so it is likely that something spooked it from the flock and he got lost. Sheep lack a sense of direction. Though their senses are keen in terms of sight and smell, but they could not purposefully find their way back home if lost. This reminds me of John 10 when Jesus compares Himself to a shepherd, and His followers are His sheep. Maybe it’s a stretch, but I think Shrek is much like a person who knows Jesus Christ but has wandered. If we avoid Christ’s constant refining of our character, we’re going to accumulate extra weight in this world—a weight we don’t have to bear. In His gentle love, our Chief Shepherd has gifted certain men whom He appointed for the very special task of watching over and taking care of His sheep. In today’s world much has been done to tarnish the reputation of the local assembly and diminish the God-given role of shepherds as overseers and care-takes of the flock. Much of the damage has been done by appointing those to the office who do not belong. Most churches have a board or committee who interview and hire pastors almost entirely based upon degrees and education. However, even though Paul himself had a college-type education under Gamaliel which undoubtedly far outstripped the education and training acquired with a Doctorate of Divinity, he had to count it all as rubbish in order to gain Christ – Phil. 3:1-11. So it follows that when Paul commissioned Titus and Timothy to appoint Pastors in churches the list of requirements never mentioned formal training or college education. Perhaps if the church would return to the prerequisites which God established our churches would again be havens of safety and spiritual growth for over-burdened and weary sheep. 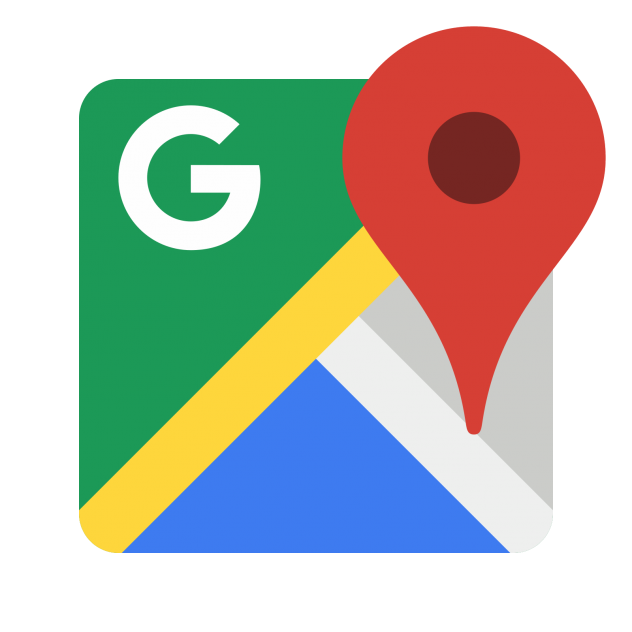 Unlike sheep, people have the ability to determine where they are heading. They can become self-willed and avoid their shepherds on purpose…and many do. People do not like to “feel” like their are being led, even though the vast majority of humans are followers by nature. It is a type of self-defeatism built into mankind ever since the fall. We want the safety of a kind and strong hand to help and guide us, but we do not want to surrender our own self will enough to be led. Pride is among our greatest inner enemies and it is by following its lead than many sheep end up like Shrek or worse. Though Shrek was miraculously able to get by in terms of food and drink during his time away from his shepherd, the one thing Shrek could NOT do was lighten his own accumulating burnden. Shrek had wool, very fine and costly wool naturally produced from his own being, but was unable to shoulder its burden nor give it to those in need. For this he needed his shepherd. 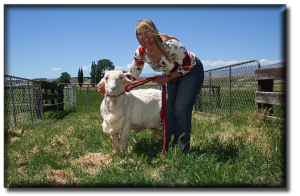 When Sherk was found, a professional sheep shearer took care of Shrek’s fleece within 20 minutes. Think about that…a 60 lbs. burden, accumulated over the course of 6 years was able to be removed from the helpless sheep in a matter of minutes! All it took was coming home to this shepherds. I believe Christ can lift the burdens we carry, if only we stop hiding. He can shave off our ‘fleece’—that is, our self-imposed burdens brought about by wandering from our Good Shepherd and those He called to care for us and equip us for ministry. “Come unto me, all ye that labor and are heavy laden, and I will give you rest. Take my yoke upon you, and learn of me; for I am meek and lowly in heart: and ye shall find rest unto your souls. For my yoke is easy, and my burden is light.” ~ Matthew 11:28-30.